Advanced Mailbox Password Recovery can recover login and password information to POP3 and IMAP accounts from any email client in existence. The included POP3/IMAP Server Emulator intercepts the login and password information sent to an email server. Forgetting a POP3 or IMAP password on a mobile client such as a cell phone or Windows Mobile communicator may be impossible to recover without Advanced Mailbox Password Recovery, but could not be easier with it. Just replace the POP3/IMAP server on the mobile device with the address of POP3/IMAP Server Emulator, and Advanced Mailbox Password Recovery will intercept and display the password the moment your mobile device connects to the server to check for new messages. 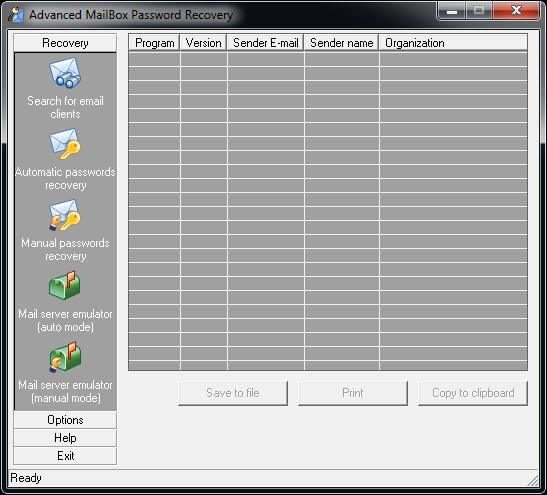 Run Advanced Mailbox Password Recovery and see all email passwords at once! Advanced Mailbox Password Recovery scans your system and retrieves all types of passwords to supported email clients in just seconds. In manual mode, Advanced Mailbox Password Recovery recovers passwords to corrupted email databases, and can operate even if an email client has been uninstalled. Please note that Advanced Mailbox Password Recovery can recover lost or forgotten password from the local account only, and requires you to be logged in to the system. This product cannot be used to retrieve somebody else’s passwords.